New Delhi: The government on Friday announced a transitional duty drawback scheme to replace the popular duty entitlement pass book (DEPB) scheme for exporters, a move that may put them at a disadvantage due to the lower tax incentive structures. The government has tried to cushion the impact by trying to minimize the difference in rates between the two schemes. The new rates will be notified within the next seven days. “For the products that were covered under DEPB but not covered under duty drawback, the huge difference in rates was an issue. We have tried to minimize the impact on exporters by capping the reduction," said finance secretary R.S. Gujral. The discontinuation of the DEPB scheme, which was started in 1997, is aimed at unifying all export promotion schemes and at the same time reducing the burden on the government. 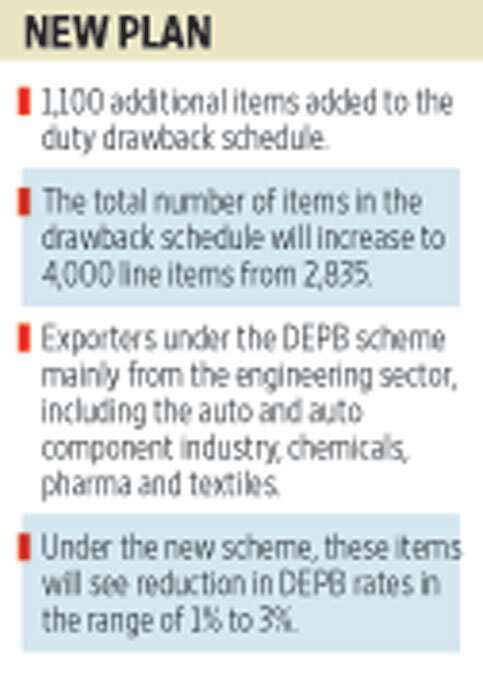 At present, there are 2,130 items under the DEPB scheme and 2,835 items under the duty drawback scheme. About 1,100 items will now be added to the duty drawback list, which will take the the total number to more than 4,000. The revenue loss to the government on account of the DEPB scheme was around ₹ 8,700 crore last fiscal year. If the scheme had continued this fiscal, the loss would have been around ₹ 10,000 crore. A “couple of aberrations had come into the DEPB scheme in the last four years",Gujral said. “First was the ad hoc increase in the rates ranging 1-3% made a few years ago that were not withdrawn. The second was that the DEPB rate has not been computed in the last four years despite reduction in customs duty rates. Therefore, DEPB rates were found to be out of touch." Ajay Sahai, director general of the Federation of Indian Export Organisations, welcomed the move as it removes uncertainty. “It seems the government is only removing the stimulus element that was introduced in the DEPB scheme in 2008 to prop up exports, which we have already factored in," he said. The changes were recommended by a committee constituted by the government in January under the chairmanship of Saumitra Chaudhuri, member, Planning Commission. Under the new scheme, the DEPB rates have been calculated on the current customs duty. “The new rates will be lower than that of the DEPB scheme, but care has been taken to minimize the impact. We have put in caps so that in the first year the effect is not too adverse," said S.D. Majumder, chairman, Central Board of Excise and Customs. Engineering, chemicals and textile exporters were the main beneficiaries of DEPB. As a transitory arrangement, these items will see a 1-3% reduction in DEPB rates. Items already covered in the duty drawback schedule will see a minor reduction in existing drawback rates mainly on account of the recent slash in customs duties on petrol. “The withdrawal of the DEPB scheme will not have much of an impact, except maybe on the auto segment," said T.N.C. Rajagopalan, a trade analyst. “In most of the cases, the reduction has been marginal. In cases where there is a bigger difference, the government has capped it." The marginal reduction in incentives will be offset by savings in transaction costs, he added. “Under the duty drawback scheme, the amount is directly credited to the accounts whereas in the DEPB scheme, the process of getting entitlements is tedious," said Rajagopal.